Slab built Grogzilla® sculpture clay and paper clay. Grogzilla® clay is a highly grogged sculpture clay with feldspar crystals. At Cone 10, the feldspar crystals "pop" and you get random white crystals. Flashing slip on greenware. Carbon trap shino glaze on bisque. Fired to Cone 10 reduction. They are totally functional pieces, yet very sculptural. I really like the textures and warm earth colors. 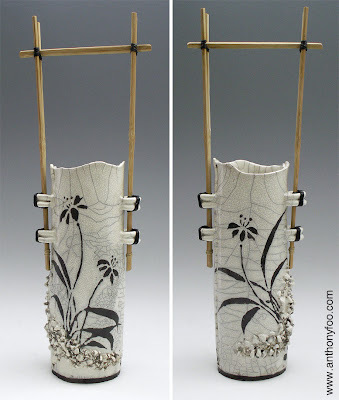 A tall, slab built triangular Ikebana vase. High fire Cone 10 reduction. With green to black flashing slip on greenware. Carbon trap shino on the bisque. 18"H x 7"W x 7"D. I made the piece hefty and heavy to be able to take some large sized branches for an Ikebana arrangement. I like the sculptural element of the piece. It can stand alone as a sculpture and it also works beautifully as a functional vessel. I think it would look great with some cherry blossoms branches. As clay artists, most of the time we work alone. Toiling away in our studios, creating inspired works that come from within us. It’s only recently through websites and social media avenues that we are able to share our work with the rest of the world. To have my work and what I do with paper clay touch another person’s heart is truly humbling and inspiring. To hear someone say something like, “you rekindle the fire in me” or “I feel empowered after attending your paper clay workshop” energizes me to keep doing what I do with paper clay – creating works that speak silently but directly to ones heart. No words are necessary nor needed. 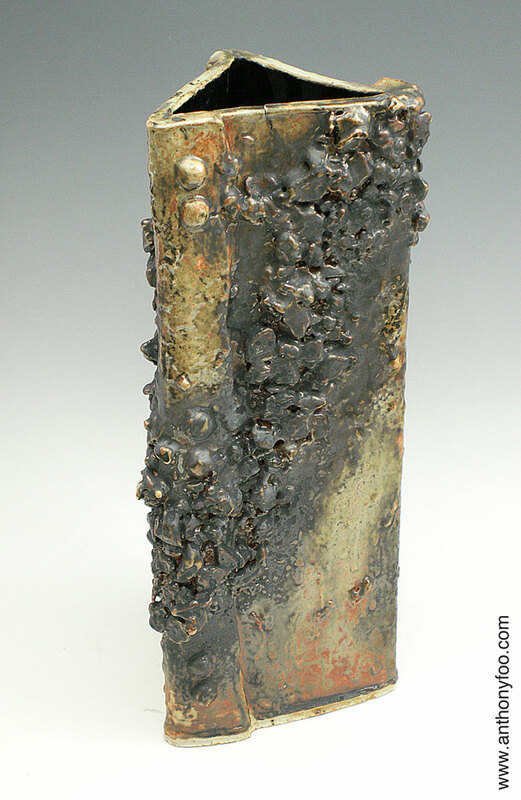 I present my work in my website, blog, Facebook, Flickr to share with other ceramic enthusiasts. My pieces reflect who I am and my life experiences. To all the clay people out there, we are already connected. Enjoy this oneness. Front and back views of my white Summer Grasses raku vase with bamboo handle. Hand built sculpture clay and paper clay. Grass orchid design is free hand wax resist. 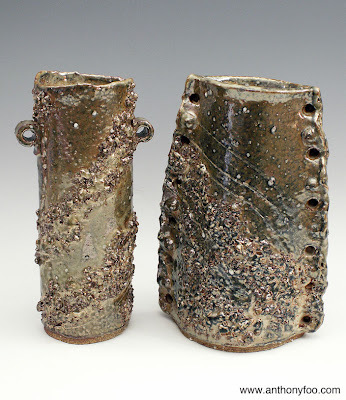 White crackle raku glaze. 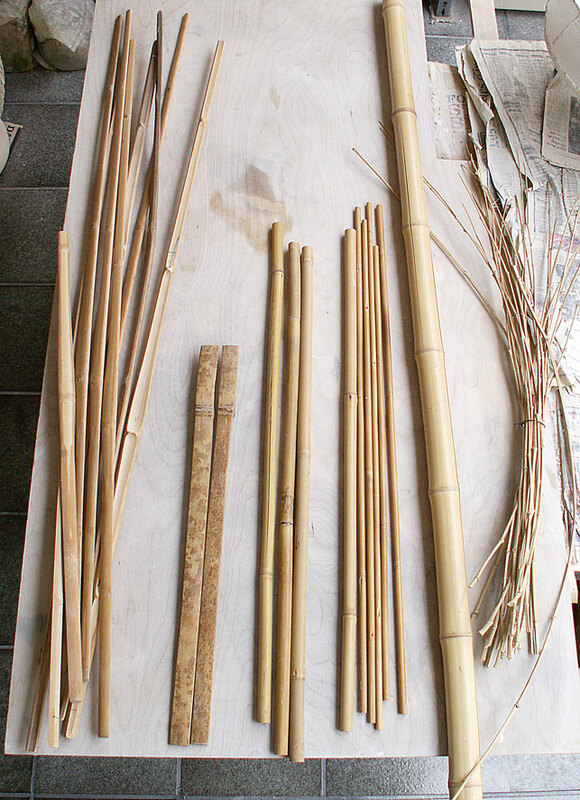 Bamboo is from recycled and repurposed old kendo shinai. Bound with waxed linen twine. 21"H x 8"W x 4.5"D.
I like the simplicity of the design. Doing the free hand wax resist is a one shot deal and I'm happy with the way the grass orchids turn out. The wax resist brushwork is done with a calligraphy brush. It is more of a sculptural piece rather than an utilitarian one. 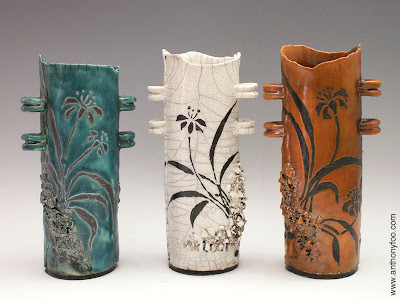 This is a continuation of my Summer Grasses series of raku vases. Hand built sculpture clay and paper clay. The grass orchid design is free hand wax resist. 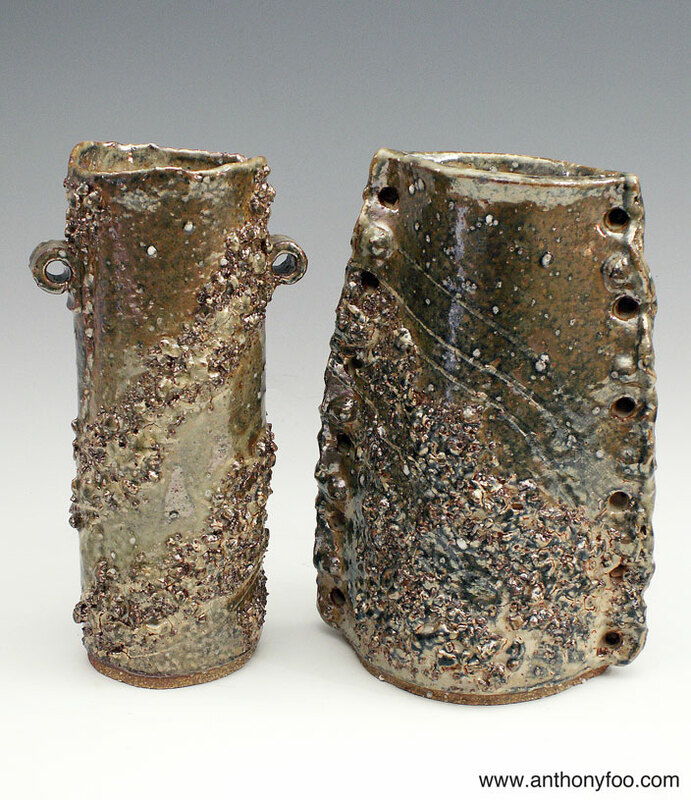 Different colored raku glazes were used. I experimented with a unique finishing technique for the one on the left. Each vase is approx 13"H x 6.5"W x 4.5"D. They are ready for my bamboo handles. There is just something about bamboo that appeals to me. The material that fits very well with the sculptural work that I make and to the Japanese esthetic that I'm attracted to. These are kendo shinai which I’m going to use for my vase handles. These two pieces are very special to me. They are remains of a bamboo ikebana vase that’s over 40 years old. I still have to figure out a way to use them. 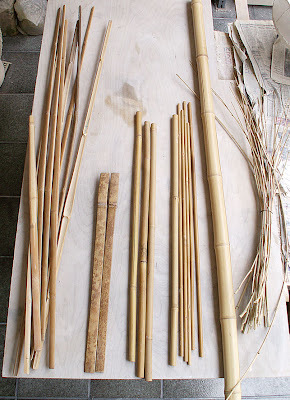 These are store bought bamboo rods, about ½” dia. These were given to me by my friend who does Japanese archery (kyudo). They are broken arrow shafts. Very straight and very nice. No wonder they cost a lot! This is a store bought bamboo pole 1 ¾ dia. These are bamboo stems from my yard. I repurpose them into handles for my raku vases. 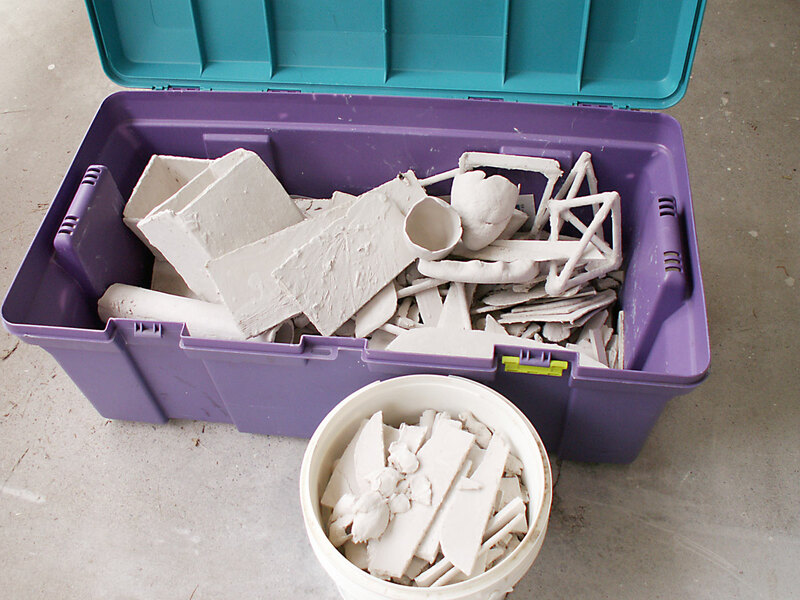 In my recent paper clay workshop, I was explaining how paper clay can be recycled, reconditioned and reused. I’ve been working in this medium for a long time now and this process has become almost second nature to me. To other ceramic artists, this is a new concept. I save all my scraps of paper clay and let them dry out. Once they are dry, they will last indefinitely and ready for me when I need them. The first step is to soak them well. This process is called slaking. Enough water is used to completely cover the dry clay. Do not mix the clay and water at this point. I leave this undisturbed for a couple of days. This picture shows one bucket with my dried out scraps. 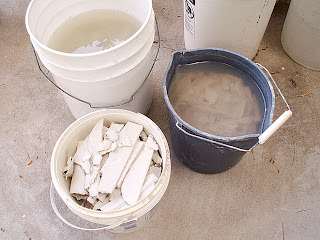 The other two buckets have my paper clay slaking it them. When I’m ready to reconstitute the clay, I pour off the excess water. You can save this pour off if you need to thin out the clay-water slurry to make paper clay slip. Then comes the messy part and your hands are great for this. Just dig in, mush and blend the clay well. Break down any lumps and try to get as smooth a consistency as possible. This may take some time. It’s a good time to wear an apron if you have one. Once this clay-water slurry has been well blended, you’re ready to dry it out. Here’s my earlier post on this drying out process. This is my patio set up when I teach my paper clay workshop at my home. It can comfortably accommodate 8 -10 students. My studio and gallery is right next to it. Although my website and blog has great images, it cannot replace the feel you get when you walk around a piece, or when you pick it up in your hands. 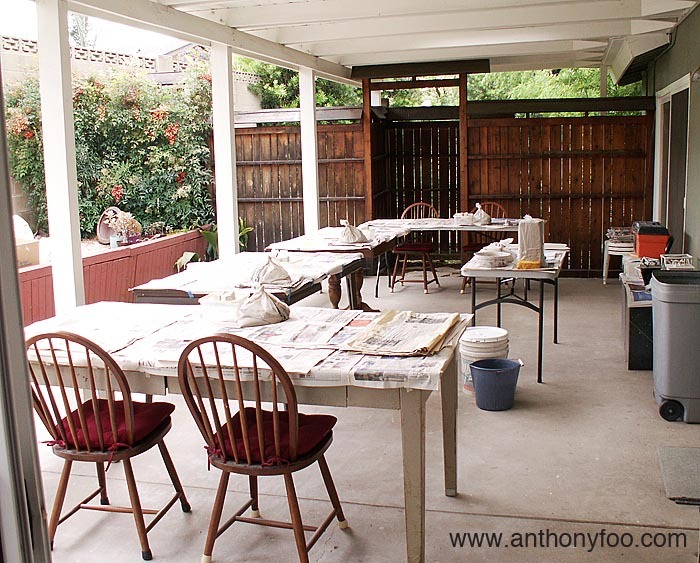 However, this time the patio will be reconfigured to hold a pot luck lunch. I’ll be having a studio/gallery tour for the students of the McGroarty Arts Center in June, 2012. The workshop was a great success and well received. As I chatted with the students and saw their eyes opened up with new possibilities with paper clay, I thought it would be a great idea to invite this wonderful group to my home to see my sculptural works. They will be able to see my completed projects and works in progress, ask questions, have a great time and hopefully leave inspired to create great works themselves. Perhaps, this will the start of a wonderful thing. Give me your tired, your dried out paper clay. Your scraps yearning to be a piece of Art. The picture shows the left over dried paper clay scraps from my latest workshop. As you can see, there’s a lot left over. But, since it’s paper clay, I never worry about this or what to do with it. One of the nice thing about green bone dry paper clay is its ability to be recycled and reused many times. When people use regular clay, they tend not to think about the clay that is going into the thrash because that cost is relatively small. A typical 25# bag of regular clay can be as low as $6.00 per bag, depending on the clay blend. Paper clay being more expensive (a 25# bag costs around $15-17.00) than regular clay requires me to think more frugally. Any paper clay scraps I throw away means I’m throwing away $$. Once the paper clay has dried out, it will last indefinitely. It is one of the methods for storing your paper clay without it getting moldy. The disadvantage of this storing method is that you cannot use your dried out clay immediately like you could fresh from the bag. It will require some planning and time, and it can be messy, especially if you are reconsituting a lot of paper clay crumbs. My process of slaking the dried out clay, blending it, and drawing the excess water out till the paper clay is in a kneable state usually takes about a week, maybe even two depending on the weather. If you have stored you dried out paper clay in sheets, and want to use them as sheets, you can reconstitute (ie rewet/rehydrate) them as such and can begin using them once the sheets have returned to their leather hard state. Most of the time, I just roll out my reconstituted clay into slabs and let it firm up. That way, I have more control over the thickness of the slabs. Save all your paper clay scaps. Recycle and reuse! Make them feel happy again to be part of a new piece of Art. I had a fellow ceramic artist ask me about the Van Gilder's flashing slip. Here's my understanding of it. The information presented is from my own experiences. The Van Gilder's flashing slip is a thick slip that's available for use at the Irvine Fine Arts Center. It can be used thick for slip trailing or thinned down for painting application with a brush. In theory, it is supposed to "flash" (ie have twinges/flashes of yellows, oranges) when you fire to Cone 10 reduction (highly reduced firing). I've only seen in flash orange once on my pinch bowls and it was rather pretty. I use it because it cracks predictably at Cone 10. It starts cracking after bisque fire to give you a nice texture. Most of the time, I use a wash of red iron oxide or manganese dioxide to impart color into the cracks. The red iron oxide will be anywhere from reddish brown to warm black. The manganese dioxide is blue black. I sponge off the excess stain from the cracked surface leaving only the stains in the cracks. The piece is then fired to Cone 10 reduction (in a gas kiln). When applied correctly, the results are very attractive. This piece has the flashing slip applied to the tentacled pods and the short stubby thorns. I used manganese dioxide stain. You can see the cracking in those areas. This is the kind of flashing that can happen in the correct environment. Notice the oranges.